Ultrafine Particulate Matter is a villain, a trained evil villain. First of all, he is deceiving. As his older siblings, Particulate Matter 2.5 and Particulate Matter 10, he is generated by combustion, mostly by on-road cars, but his tiny size makes him ultra dangerous. He can sneak into places his sidekicks can’t, such as your blood stream and by concentrating his particulates, he has the capacity to affect larger areas of lung tissue. Undetected for many years his performances flew under the radar. He attacks mostly close to his place of origin, usually freeways, light industry and waste sites on densely populated areas. His favorite victims? Working class communities. The worst thing is that he is no joker: travelling directly to all the organs, he exacerbates respiratory and cardiovascular diseases and is related with higher rates of asthma and mortality. Watch out, you may not see him but he will get you! Despite his ultra-small size and almost undetectable presence, Ultrafine Particulate Matter has found roles in deteriorating your health! UPM can be found in a variety of roles in combustion-based emissions from petroleum refining, waste burning, public transportation and factories. His biggest role: car exhaust! As a result of this, inhabitants of large cities and industry workers experience health problems because of Ultrafine PM’s cunning performances. According to the EPA, exposure to Ultrafine Particulate Matter can cause lung and intestinal damage, oxidative stress, and increased rates of asthma (which caused 250,000 deaths in 2009). There are also many indoor sources that Ultrafine Particulate Matter has had supporting roles in, such as laser printers, fax machines, photocopiers, chimneys, and vacuum cleaners. Due to his nanoscopic size, UFP can easily be inhaled by humans causing considerable damage to the lungs and other internal organs. Once in the lungs, UFP seeps into you bloodstream where he can have an immediate affect your health. Ultrafine PM loves to create a ruckus in low income communities of color in urban areas, who often live near or work in dirty air industries and/or live by freeways. It’s a double whammy! UFP has a serious Napoleon Complex- he’s a persistent air pollutant because his small size makes removal efforts nearly impossible. The only true way to remove the amount of UFPs would be to remove this villain from vehicle and industry emissions roles. Although Ultrafine Particulate Matter is a newly recognized chemical at the Toxies, he has been able to garner fame as one of the most mysterious and undetectable nominees due to the lack of preventative research being done about him and his small size. However, scientists have been able to pin-point that much of the Ultrafine Particulate Matter polluting our air is from a large amount of vehicle emissions, which goes hand-and-hand to our crude oil use. Under the Clean Air Act, UFPs and other hazardous pollutants are being regulated in order to protect the public’s health. However, recently experts and recognized that the only significant way to reduce the amount of air pollutants is to limit our dependence on non-renewable energy sources. Ultrafine Particulate Matter owes much of his success to the major oil companies like Chevron and BP, who relentlessly drill from our planet’s depleting oil reservoirs to supply energy to our many power plants and vehicles as possible. 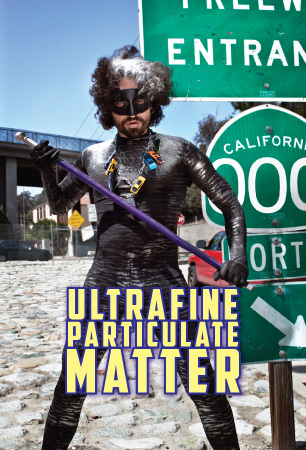 Luckily for this supervillain, Ultrafine Particulate Matter has the ability to cause lung disease and other harmful conditions, often undetected so his performance will be recognized for generations to come.